Click on "Fairview.AVI" above for a quick movie of the cemetery. This video shows the Fairview Cemetery, Bangor, Wisoconsin and the JW Jones grave site and the other Jones grave sites in the immediate vicinity JW's tombstone. 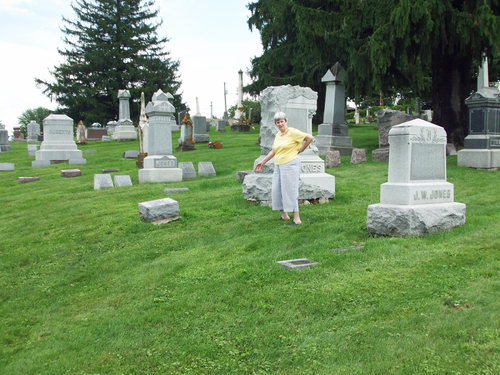 Cousin Jane Stillman and I (Tom Sollenbarger) visited the cemetery in 2009. We are the great granchildren of JW and Mary Jones. 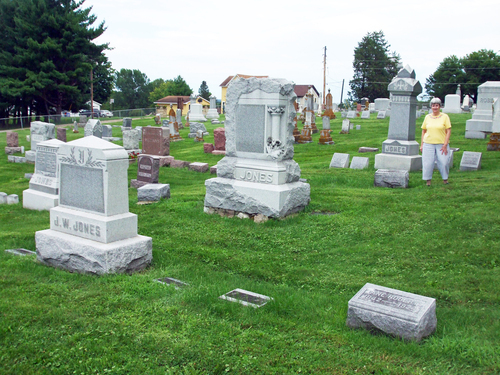 The JW Jones plot is the shown with the family tombstone at the lower left of the picture. John W Jones head marker is to the left of the Jane Roberts headstone. His wife Mary's headmarker is next to his. To the left of the tombstone is John and Mary's daughter Mary's headmarker. Great great grandmother Susannah Jones' headmarker is not in this picture. It is to the left of Mary. Note that there are three other Jones burial plots immediately adjacent to JW's plot. As far as we can know, none of these families are directly related. Jane Stillman is standing by the tombstone of the Edward Jones family. Jane is standing just behind the JW Jones family plot. The grave markers shown in this picture are of Susannah and daughter Mary. Susannah's is to the far left. Jane is pointing to something on the family plot of the grave site immediqately behind JW's plot. She probably is noting that some of the inscriptions on the grave stones are in Welsh.